In my last blogpost, I described how tertiary and quaternary rainbows in the light of a halogen lamp and made by drops from a spray bottle can be photographed. The quinary rainbow I had not been able to detect back then, so I gave it another try two weeks later (on April 14th, 2018). 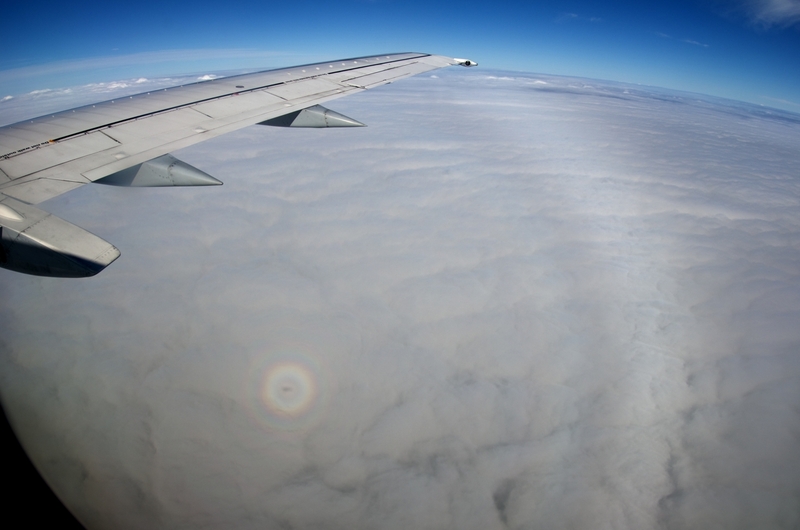 I chose a more conventional wide angle lens with f = 18 mm (Pentax DA 18-55 mm at a Pentax K-5 camera) instead of a fisheye this time, so that both the peak illumination intensity and the drops can be confined to a specific rainbow sector without the need to care about the rest of the rainbow circumference. Also, I hoped that a lens hood (which cannot be applied to a fisheye objective) might help somewhat against the wetting of the front lens by drifting drops. However, this did not work out, and the wetting problem did in fact worsen due to the fact that the lens has now to be pointed upward to capture the upper sections of the rainbows against the sky. This creates a much more efficient target for falling drops. The arrow points to the green/blue stripe of the quinary rainbow inside Alexander’s dark band. Ironically, I had taken this only as a fun shoot because of the twisted look of the primary, and did certainly not expect it to be the only reference image for the quinary from this series. 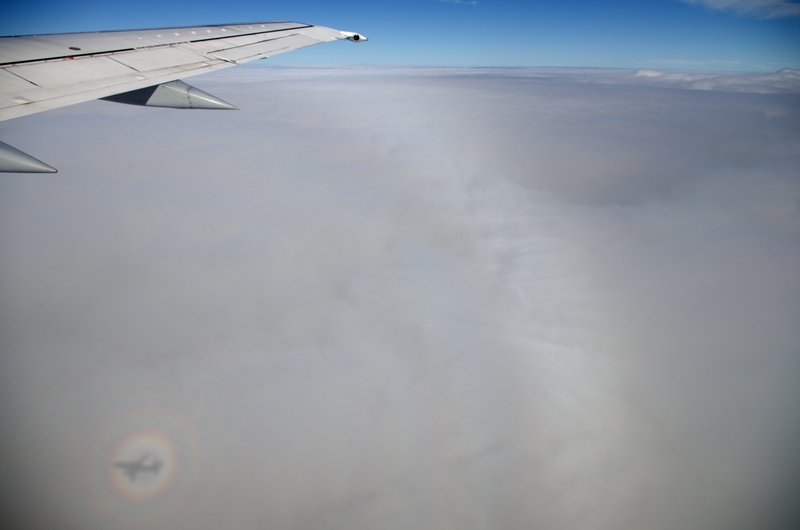 At the location of the dark band crossing the primary, the shadow of the spray bottle was cast on the drop cloud, which suppressed part of its “rainbow response”. The remaining drops outside the shadow might have had a different size, and/or the remaining divergence of the light source did play a role. Even at a distance of 10 m from the lamp, a lateral displacement of a drop by 50 cm corresponds to a shift in the lamp position (as seen by this drop) of about 3°. So the deviation of the Minnaert cigar (which has more of an apple shape here) from an ideal cone will still have an appreciable influence. This can only be reduced by increasing the distance to the light source or by confining the drop cloud to a region closer to the camera. After almost 7 years since the first successful documentation of higher-order rainbows, we are now aware of at least 40 photographic observations of tertiary bows, sometimes accompanied by quaternaries. It is the more surprising that so far no one seems to have tried an outdoor experiment using artificial light and drop sources to bridge between the natural observation and single-drop scattering experiments, in which caustics are projected onto a screen. Such an outdoor setup does not only allow to test various cameras and post-processing methods, but may also help to introduce newcomers to the challenges of observing higher order bows against the intense zero order background. Also very practical issues such as drops on the front lens or wet cameras can be directly experienced. The setup is quite similar to what is used for diamond dust halo observations in Finland. The experiment is carried out at night in order to exploit the optimal background conditions of a dark sky. A bright searchlight lamp creates an almost parallel light beam with small opening angle, in which the camera is placed. Direct illumination of the camera is blocked by a cardboard disc placed roughly halfway between lamp and camera. This also helps in the case of photographing primary and secondary rainbows (i.e. the lens is pointing away from the light source), as stray light entering through the viewfinder on the camera backside can spoil the pictures. I tested both Xenon (HID) and halogen lamps in the power range of 50-100 W. While Xenon lamps are brighter at the same power consumption, their non-thermal emission spectrum may lead to rainbows whose color is dominated by blue and yellow only, also the emitted light can show unwanted yellowish tinges in certain emission directions. The pictures shown here were therefore taken using the 100 W halogen lamp. Drops were created by an ordinary spray bottle and, as judged by the appearance of the rainbows, are somewhat smaller than the ones in natural rainbows. Due to wind or movements of the bottle a spatial separation of smaller and larger drops can occur, as indicated by several well formed supernumeraries on both the primary and secondary rainbows which become visible for some moments. However, I decided not study these detail here, and tried to create a more or less spatially homogeneous spray including all available drop sizes over the exposure time of 2-5 s for each picture. At that time, there was also some light natural drizzling going on, which generated only a weak primary rainbow in the lamplight. The limiting factor here is not the much lesser density of drops than in the spray (this could be helped by longer exposure times or stacking), but rather the background illumination of the sky (the pictures were taken in my garden in Hörlitz, Germany, which is a rather rural, but still pretty illuminated place, and there was also the nearly full moon behind the clouds on the evening of April 1st, 2018). A major problem is that drops on the front lens disturb the recorded rainbows massively, as becomes apparent after unsharp masking. This problem is especially severe when using a fisheye lens (which does not have a suitable lens hood), and under windy conditions which shift the drops into unexpected directions due to swirled gusts near the ground. Periodical wiping of the front lens is therefore indispensable. Of course, the camera itself should be proof against spray water. 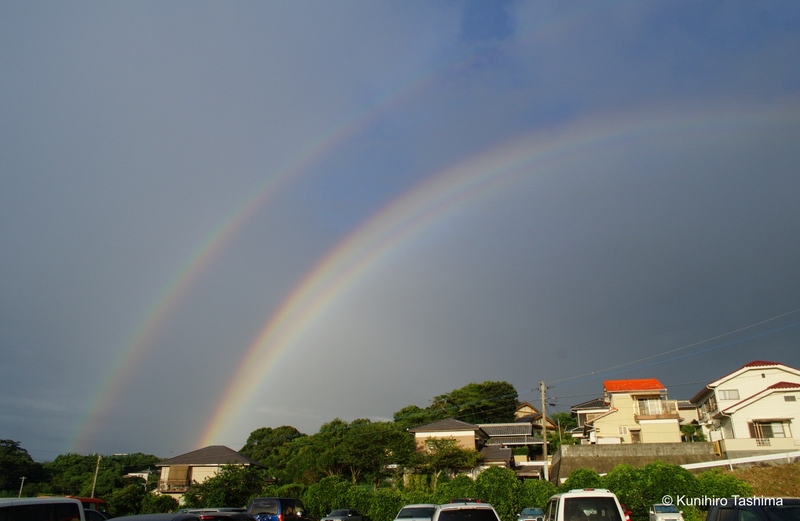 It is known from calculations that the contrast of the tertiary rainbow lies close to the detection limit of the human eye (see here and here), at least for purely spherical water drops. Here, no traces of it could be seen directly, even when looking through a polarizer. The main problem is that the spray lifetime is only a few seconds and the observer is constantly busy to maintain a more or less constant amount of drops in the air, which is rather distracting. A garden hose may be worth testing in the future. So far, no unambiguous traces of the quinary rainbow (see here and here) could be extracted from Alexander’s dark band, in which its green and blue parts are expected to follow immediately the red rim of the secondary. There are several reasons which make its detection difficult here. At first, the drops are generally smaller and thus the secondary rainbow wider than in a natural setting. Next, the weak but non-zero divergence of the illumination may blur the rainbow positions further. Also, the background includes green plants in some directions which hinders the detection of green rainbow features. A more detailed study using a darker background and a narrower drop size distribution (with appreciable supernumeraries) seems necessary. 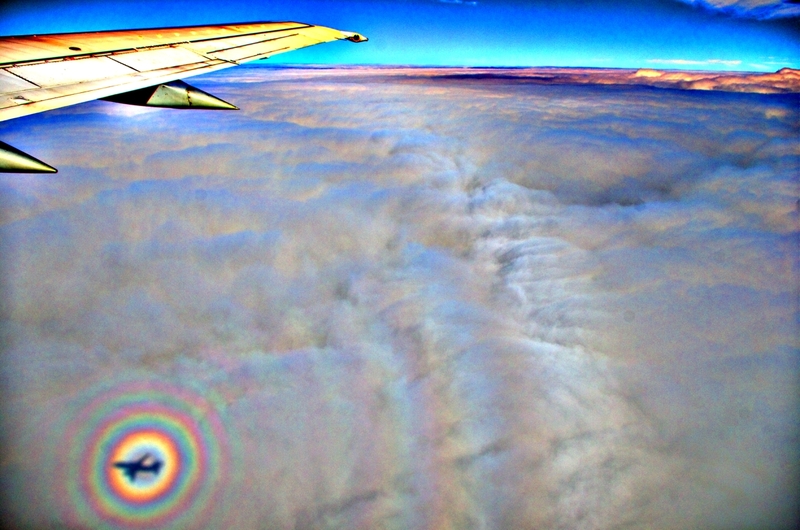 In 2014, Harald Edens reported ten cases of photographically detected natural quinary rainbows, recorded during 2009-2013 in New Mexico, USA, at altitudes of 1.8-3.2 km. These and some newer observations can also be found on his website. So far, no reports from other locations have been published. In the German observers’ network, we analyzed many candidate photographs showing bright primary and secondary rainbows, but from most of them no reliable traces of quinary rainbows could be extracted. Such analyses are not easy, as the quinary signal is weak compared to the neighboring secondary rainbow, and processing methods such as unsharp masking can cause a leakage of colors into Alexander’s dark band. Furthermore, the processing operator will experience disturbing afterimage issues from the intense renditions of the primary and secondary on the screen after a couple of minutes. Despite these difficulties, we now believe that we have identified three cases of genuine quinary rainbows. In cases 1 and 3, the quinary could be extracted from several photographs. Nonetheless, in order to keep this blogpost brief, we restricted ourselves to show only one image (or the results from one polarization series in case 1) per observation. We chose a straightforward processing method (= only increasing contrast and saturation, no local filtering such as unsharp masks) similar to the one applied by Harald Edens to allow for an easier comparison with his results. Alternative processing routes will be presented at a later stage. 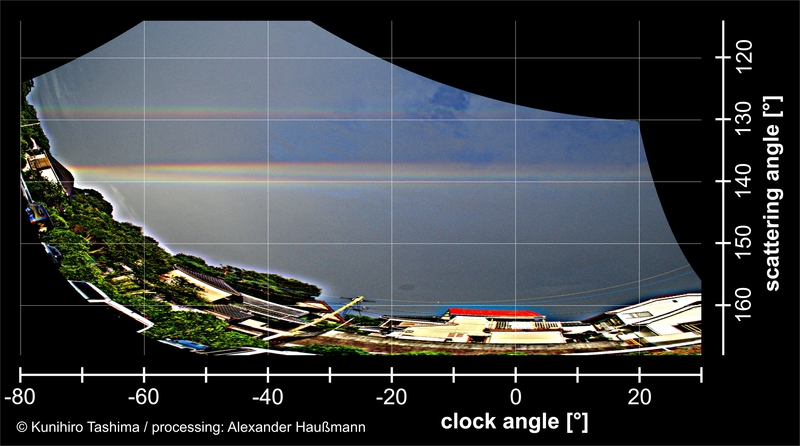 The original intention of Frank Killich was to use the primary and secondary rainbows as test objects for a home-built photopolarimetric setup made from a Canon 20D camera and a linear polarizer precisely rotatable by a stepper motor. By recording four successive images at polarizer positions of 0°, 45°, 90° and 135° with respect to the vertical, it is possible to reconstruct the first three components of the Stokes vector for each viewing direction (pixel coordinates) and color channel (red, green, blue) individually. These images can be numerically combined to reconstruct the unpolarized intensity (= the ordinary photographic result without a polarizer) and, moreover, the linearly polarized portion of the recorded light distribution (= the total intensity with the unpolarized background removed for each pixel). In the case of rainbows, this corresponds effectively to a subtraction of the radial (weak) component from the azimuthal (strong) polarization component equally all along the visible part of the circumference. As known from theory, also the quinary will be easier to detect in such a polarization contrast image. The expected broad bands of green and blue are clearly visible in the processed linearly polarized portion picture, and might be slightly visible also in the unpolarized intensity. The other two photographic observations were carried out without any polarizers, i.e. only the unpolarized intensity information is available in these cases. A slight green/blue hue is visible inside the secondary at and slightly above the horizon. A description of this observation (without discussing the quinary rainbow) can be found here. The images shown here are cropped from a fisheye photograph. Again, a slight green/blue hue appears close to the horizon. At this point it is of course not possible to draw any statistical conclusions about the frequency of detectable quinary rainbows. However, it seems worthwile that every rainbow observer re-examines his photographical treasure trove for previously overlooked rarities, even if no polarizer enhancement was involved during photographing. Over the past two decades it has become a tradition among my friends to carry out a bicycle tour to the Elbe Sandstone Mountains (“Saxon Switzerland“) at the Pentecost weekend. We then often pay a visit to a table hill named “Großer Zschirnstein“ (561 m), which features a remarkable cliff of 70 m in height at its south-eastern edge. Almost 15 years ago, on the evening of June 3rd, 2001, we had the opportunity to observe from there a rainbow extending well below the horizon almost down towards its bottom. Unfortunately, we only had a compact camera without a fisheye lens at hand back then, so the old photos show only some sections of the whole phenomenon. This year, on May 15th, we were finally granted the proverbial second chance. I already anticipated some rainbow potential in the “Icelandic” weather that day. In the early afternoon, there had already been a rain shower while the sun was shining, but as we had not yet ascended the mountain and the sun was still high in the sky, there was no chance for a rainbow observation. Unfortunately there was no safe way to access a viewpoint which would have allowed to study the missing quarter, as this would have required some careful climbing around the sandstone rocks for which I already felt too excited at that moment. The fisheye picture can hardly express how huge both rainbows looked like, and how beautiful the raindrop clusters glittered as they drifted around the cliff some 10 m further down. These are certainly the moments that make you understand that famous “double rainbow enthusiasm”, thought not everyone is as outgoing as other people on the internet. Maybe we also stayed a bit calmer because the strong and cold wind added a rather painful component to the taking of photographs and videos. This photo has been processed in a way that no color channel reaches saturation, which is a necessary prerequisite for analyzing possible kinks in the rainbow. In this case, the red rim looks as if would bend inside a bit below the horizon, but this might only be an illusion due to the intensity gradient. But the story does not end here. When going through the pictures later at home, I suddenly realized that I had missed to look for higher order rainbows, or to deliberately take some pictures in the appropriate directions. I was a bit disappointed about my inattentiveness, since this had been my best rainbow display in years and, moreover, I had not been hindered by the limited field of view from a window in a city building. I am often forced to decide between the sunward or antisolar hemisphere when observing rainbows from there. Luckily I had taken two pictures (an exposure bracket) towards the sun just at the moment when the three-quarter rainbows started to evolve. The reason for this was only the lighting atmosphere – it was the moment when the sun rays had first reached the Zschirnstein plateau. As I deduced later from the movement direction of the shower, there had been rather good conditions for the formation of tertiary and quaternary rainbows when the picture pair was taken. So I decided to apply the strong filtering procedures which are needed to extract higher-order rainbows from photographs. The shorter exposure just gave noise in the interesting region. However, in the longer exposed version something interesting popped up. Slightly to the right above the stone pillar, a red-green stripe in the color ordering of the tertiary rainbow can be discerned. For an unambiguous identification it would, however, be necessary to calibrate the picture in order to assign scattering coordinates to the photo’s pixel matrix. Though I had previously calibrated the projection of the lens for the used focal length (the upper end of the zoom range), I would need two reference marks with known elevation and azimuth which are included in this specific photograph to complete the analysis. On the horizon, no distinct remote references could be found. This means that I would have to reconstruct my precise position on the plateau to minimize parallax errors, and then to record a starfield image from there at night, enabling me finally to use the stone pillar or nearby trees as references. Unfortunately, it would take an inconvenient amount of time to access the spot again and the effort for such a trip would be a bit over-the-top for the sole purpose of calibrating a photograph. 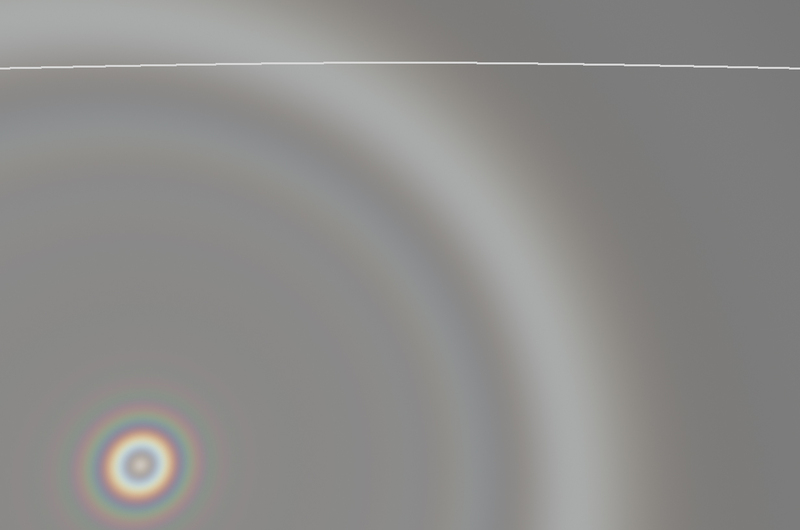 The colored stripe seems to fit reasonably well to the Descartes angles of the tertiary rainbow, especially when taking into account that the positions of maximal intensity are shifted a bit inward from the Descartes angles for the tertiary (and outward for the quaternary) due to wave-optical effects. This shift was also noted in the analysis of the very first photograph of a tertiary rainbow. Further contributions form distorted drop shapes are of minor importance here, as the sun elevation is small and we are looking at the rainbow’s sides. Therefore the effective cross section of the drops should remain nearly circular, even if they are squeezed in the vertical. I leave it to the readers to decide if also traces of the quaternary might be visible among the color noise slightly to the left above the stone pillar. Addendum: A short video clip from the observation can be found here. On Sept 25th and 27th, 2014, I was traveling by plane from Dresden to Brussels and back, with stops at Frankfurt and Munich, respectively. As usual, I booked window seats to study sky phenomena. The sunward side was not very interesting, since these short-distance flights are carried out at heights below the cirrus clouds and therefore no sub-horizon halos can be observed (at least in autumn). On Sept 25th only a single 22° halo appeared in the cirrus clouds above the plane, whereas on Sept 27th ice crystal clouds seemed to be fully absent. This simulation was calculated for the original lens projection with added ad-hoc gray background. It is also available as a fisheye view centered on the antisolar point without background , together with the corresponding simulation for monodisperse drops (no spread in size) of 8 µm in radius . For comparison, the fisheye simulation centered on the antisolar point was calculated for the 1 µm drop size spread as well . Furthermore, I recorded a video sequence showing the movement of both glory and cloudbow across the uniform Ac layer (11:15, ). When later the edge of the Ac field was reached, the glory showed an appreciable degree of distortion (11:18 CEST , processed version ). On Sept 27th, not a uniform but a fractured Ac layer was present after the take off from Brussels. Nonetheless the glory appeared circular (12:34 CEST , processed version , video at 12:37 CEST ), with the exception of occasional larger disturbances in the layer (12:34 CEST ). The cloudbow was not as prominent as two days earlier. During the later part of the flight only occasional Cumulus clouds were present, which did not allow for further glory observations until the plane started descending when approaching Munich. At this point the angular size of the clouds became large enough again to act as suitable canvas for the glory (13:14 CEST  ). During the final passage through a Cu cloud I recorded a further video (13:15 CEST ). Remarkably, the angular size of the plane’s shadow varies rapidly (indicating the distance to the drops) whereas the the angular size of the glory remains rather stable (indicating the drop radius). Photos and videos were taken with a Pentax K-5 camera equipped with either a Pentax 10-17 mm fisheye or Pentax-DA 18-55 mm standard zoom lens. A gallery view of my photos can be seen here . Chasing the circumhorizontal arc (CHA) has become a quite popular activity among the German halo observers. Depending on the latitude, there is only a 1-2 h time slot at noon for a few weeks around the summer solstice. Even the highest elevation the sun can reach is still a few degrees lower than the optimal value for CHA formation. This might only be beaten by the moon in a suitable position with respect to the ecliptic. I was keen on observing the CHA this year as well, and had not had any luck so far. On Saturday, June 28th, there had been a single 22° ring before noon at my home in Hörlitz (51° 32’ N, 13° 57’ E). At 12:45 CEST I got on my bicycle for a visit in the neighbouring village. Already after 500 m I had to stop: The 22° ring intensified, and although there was still nothing else visible with the naked eye, I decided to take a fisheye picture at 12:51 for a later analysis. 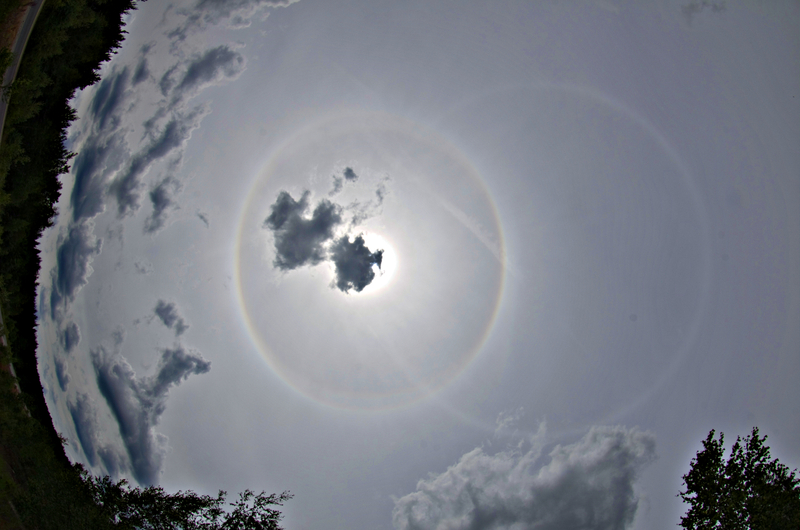 As seen in the unsharp masked version, the complete circumscribed halo and parhelic circle were already accompanying the 22° halo. With an ordinary wide-angle lens I took a “blindfold” picture deep in the south a minute later, and after unsharp masking both the CHA and the infralateral arc could be distinguished. Of course this was unknown to me during the observation, but I felt some kind of suspicion that there might be more in the sky than I just saw (even by looking through a grey filter or using a black watch glass mirror). Around 12.53 I noticed the parhelic circle high in the sky, which had a diameter only slightly larger that of the 22° ring (~29°). Within the next few minutes the circumscribed halo became bright enough to appear clearly separated from the 22° ring at the sides. There were no traces of plate halos such as the 120° parhelia which I took as a bad sign for the CHA. There were now also cumulus clouds gathering in the south. I moved on a bit, but stopped again after a 1 km: The sight of this huge “wedding ring”-like pattern in the sky was just too fascinating. I also scrutinized the south from time to time: Wasn’t there any colourful band appearing in the gaps between the Cu clouds? From time to time I thought that that I could see a part of the CHA, and the photos later proved that it was actually there, but I was not sure if I were just imagining something after staring too long into the sky. Consequently, I do not count this as a successful visual CHA observation. After reaching my destination at about 13.25, the Cu clouds were obstructing larger and larger parts of the sky as the halos were fading away in the gaps. 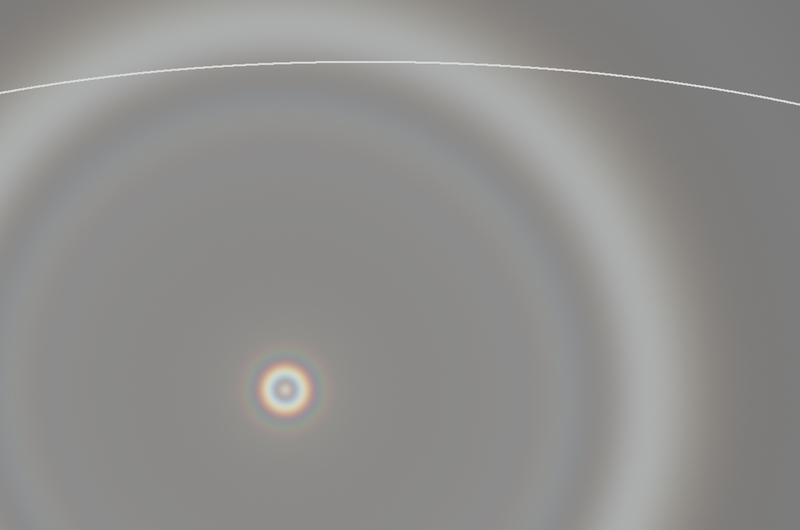 I really had the luck to observe a parhelic circle at almost the highest possible solar elevation at my place (61.7° at 13.07)! Only 0.2° were missing to the ultimate maximum a week before the observation. When going through the pictures again, I also found the upper part of the Parry arc in the filtered versions. Remarkably, the part below the parhelic circle is missing, and I do not have an explanation for this at hand at the moment. Nonetheless, the presence of the Parry arc allows to discard plates at all: The CHA may as well be generated by Parry crystals, as seen in this HaloSim simulation. However, when the portion of Parry crystals is increased to the point at which the CHA is rendered at a reasonable intensity, the Parry arc appears too bright. A representative selection of images from this observation is available here. Each year during the Pentecost holidays I undertake together with some friends a cycling tour to the Elbe sandstone mountains. This is usually a good opportunity to look for atmospheric phenomena, since we are out in the open the whole day. However this year we just had the sun shining from a plain blue sky most of the time. I feared that nothing interesting would happen, but I was wrong: In the evening of June 8th, thunderstorms were active about 200 km or more to the northwest from our location (Großer Zschirnstein, 50° 51′ 23″ N, 14° 10′ 34″ E, 561m). The top parts of these clouds acted as apertures to cast crepuscular rays through the sky shortly after our local sunset. To the south the view from this mountain is fully unobstructed since the lookout point is located right above a 70 m high rock cliff. Our struggle to thrust the bicycles up there was rewarded by the beautiful sight of a bright, rosy coloured beam extending from the twilight sky in the northwest to the rising earth shadow in the southeast and passing just below the waxing moon. Even with a (full frame) fisheye lens it was hard to capture due to its extension of about 180°, so I decided to do panorama stitching from an image series (21:26 CEST: local solar elevation -1,5°). One should keep in mind that in reality crepuscular rays are straight lines and the curved shape in the photo is just a result of the cylindrical projection. Likewise it would have been possible to distort the horizon and make the crepuscular ray straight. Having a look at a panning video may be the best way to understand the geometry. Some minutes later (21:31 CEST: local solar elevation -2,3°) a second beam had appeared quite prominently above the first one, and even more might be detectable by image processing. Though all of them being parallel straight lines in 3D space, the mind is always tempted to interpret them as fanning beams like the emissions from a lighthouse. Until 21.40 the rays disappeared almost completely apart from the foremost part in the northwest, which itself became quite bright at that time. Around 21.48 the cumulonimbus clouds themselves became visible for a while. This change in illumination and visibility must be caused by the increasing solar depression below the horizon which leads to more vertically inclined sunbeams, until the sun finally sets at around 52° N / 12° E (where the clouds might have been) in 10 km of altitude as well. In my last post I outlined several possibilities to explain the great brightness of the antisolar arc (AA) compared to the heliac arc (HA) in the Neklid display from Jan 30th, 2014. All of them were a bit off the main road of traditional halo science, but traditional arguments did not help to clarify what was observed, hence I had to look for something else. Both the concepts of plate Parry crystals and trigonal Parry columns should yield weak traces of unrealistic (or better to say non-traditional) halos that might appear in a deeper photo analysis. Claudia Hinz provided me with a set of pictures from the display to unleash any kind of filters that would seem appropriate. Indeed it was possible to pin down traces of the Kern arc in some of the pictures after the initial application of an unsharp mask (1, 2), followed by high-pass filtering (1, 2) or, alternatively, by Blue-Red subtraction (1, 2). Note that the Kern arc was weakly present in the simulations for hexagonal, Parry-oriented plates. This, of course, must not be confused with the recently proven Kern arc explanation relying on trigonal plates in plate orientation. Finally, trigonal columns in Parry orientation are a third non-traditional crystal configuration giving rise to new halos. However, these do not yield a Kern arc. 1) For Parry plates, the upper suncave Parry arc does not show an uniform brightness, but appears brighter directly above the sun and loses some intensity towards the points where it joins the upper tangent arc. 2) The upper loop of the Tricker anthelic arc is suppressed for columns, but shows up for plates. 3) Some extensions of the upper Tape arcs appear between the Wegener arc and the subhelic arc. At least the first two points can be answered in favor of the Parry plates, being visible even without strong filtering. However, I failed to detect any extended Tape arcs as “ultimate proof” so far. This might not surprise since they are, according to the simulation, comparable to the Kern arc in intensity and appear in regions of the sky where the crystal homogeneity was not as well developed as in the vicinity of the zenith. Piecing the parts together, it seems evident that at Neklid the AA intensity was due to Parry-oriented hexagonal plates. Their traces were detectable, whereas nothing appeared that would hint on trigonal Parry columns. In contrast to this, Parry trigonals were responsible in Rovaniemi 2008. This implies that in nature at least two different mechanisms occur for AA brightening. Finally the question remains how plates may get into a Parry falling mode. But as long as no one understands how symmetric columns do this (though we have the empirical evidence), we should be prepared for surprises. There might also be a connection to recently discussed details of the Lowitz orientation (2013 Light and Color in Nature conference, talk 5.1).